The current photography exhibition of Mark Shaw's photographs at Liz O'Brien's New York gallery is at once remarkable, beautiful, poignant and wonderfully chic. As viewers we are invited to a specific time and place where two creative individuals met in New York's high society of the 60's resulting in a unique collaboration. 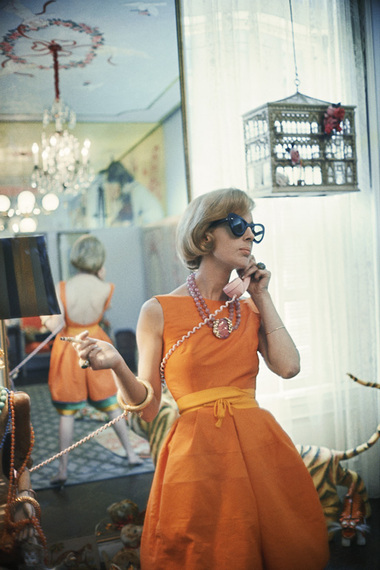 Mark Shaw, a celebrated photographer with a realists' eye for glamour and style was a personal friend of Tiger Morse, an innovative fashion designer with fearless individuality. Her model-like sleekness and poise combined with an un-self-conscious strange beauty was admired and imitated by many women in her social circle. Both also were clients of Max Jacobson, the notorious "Dr. Feelgood" known for liberally supplying his celebrity clients (including JFK) with "vitamin" shots of super-charged doses of amphetamines. Mark Shaw's considerable talents were not limited to fashion photography; the subjects of recently published works include numerous celebrities at work and at play as well at least one compelling volume documenting John F. and Jacqueline Kennedy's young family. 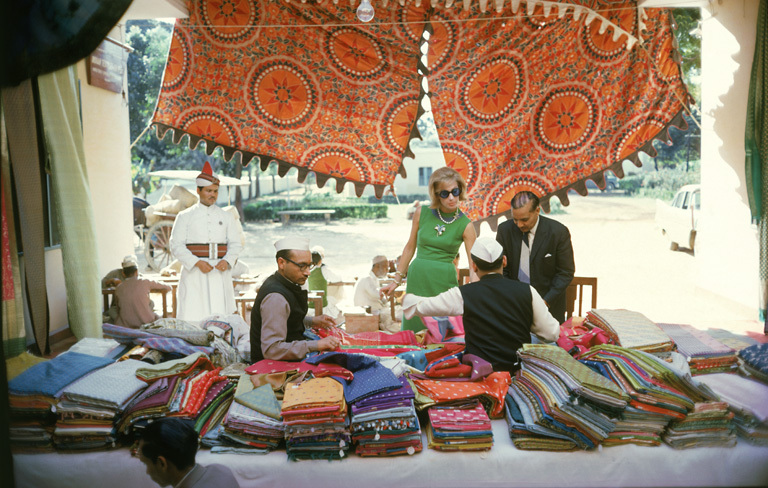 In 1962 on assignment for LIFE, Mark Shaw accompanied Tiger Morse throughout Asia sourcing fabrics for her clothes as well as home accessories she sold in her exclusive boutique on the Upper East Side, A La Carte. What emerged from this exuberant travelogue is a series of enchanting color photographs that contrast Tiger's perfectly coiffed and unique fashion sense against the hustle and bustle of the world of commerce in the far East. One can easily see how these cultural experiences would expand her awareness and inform her design sensibilities. She further translated her authentic style mix to interiors by way of the accessories and furnishings purchased during her whirlwind travel adventures. Tiger had a knack for combining high and low style, borrowing from the past to bring something into the present, often referred to as Hodge-podge or Bricolage . Her whimsical and spontaneous designs were a breath of fresh air against the severe minimalist aesthetic of that era. Working my way thru the stylish crowd on the opening night I marveled at the interlocking personalities that converged to create this exhibition. Mark Shawn's clever and seemingly spontaneous photography captured the effervescent Tiger Morse and that particular era; their shared love of coloring outside the lines and portraying a chic madcap world is palpable. What emerges is a colorful depiction of a woman ahead of her time, following her passions and boldly standing out from her high society clientele. Add to this heady mix curator Alan Rosenberg's considerable knowledge and personal insights into fashion's history, design, the multi-layered story of New York City at that time. Lovingly exhibited in Liz O'Brien's sumptuous jewel box of carefully selected furnishings, lighting and accessories and -- voila! -- it's truly a wondrous feast for the eyes and senses. The large scale photographs and fascinating commentary flow into the setting and vice versa. I can just picture Tiger perched on any one of the gorgeous velvet sofas. Exhibitions that are this thoughtfully organized invite viewers to look at the bigger context, to consider other outsized talents and their visual impact over time. And what extraordinary collaboration is just under the radar and influencing us at this very moment? One can only hope that it is at least as compelling and fun as this one surely must have been.